A healthy dog is a happy dog. 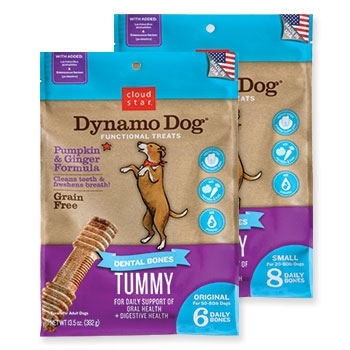 Keep your dogs feeling tip-top by giving them a treat that soothes their tummy and supports daily digestive health. Pumpkin, ginger, and added probiotics to help with digestive health.Textured surface helps remove plaque buildup and promotes healthy gums. Grain free, gluten free, and free of anything artificial. All natural and easily digestible.